Christine & Dianne together: We are in Vermont! We have an entire week planned with braiding and hooking events. Yesterday we went to the “Hooked in the Mountains” Rug Hooking Show put on by the Green Mountain Rug Hooking Guild. There were several featured artists, which were amazing, but I (Christine) have to say that I enjoyed seeing the rugs submitted by the guild members more than the featured artists! Seeing the different techniques, different color palettes, and incredibly varied imagery in the rugs was great. We enjoyed stopping by our friend Kris McDermet’s class, where she was teaching how to braid around hooking and make 9-loop centers. The class was very friendly, and they were clearly enjoying the class. Kris has several rugs on display; my favorite is her new rug Labyrinth, a large round 7-circuit labyrinth. The walls are out of braids; the path is hooked and shows images of the bugs, leaves, flowers, paw- and hoof-prints that are found in the labyrinth in the woods near her home. 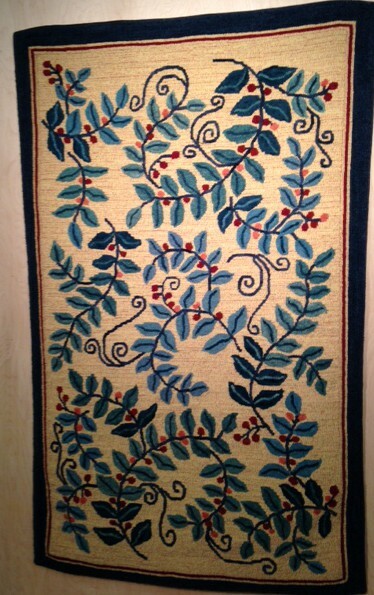 Some of the other rugs we liked: this one is called Mariner’s Compass by Gail Duclose Lapierre. There are 7 hooked elements that are united by surrounding braids. 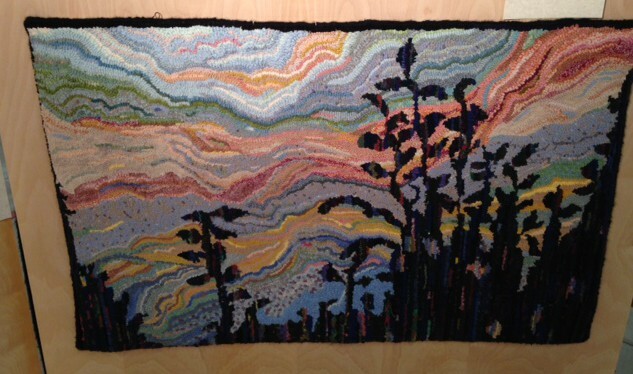 Another really neat rug is hooked only: this one is by Beth McDermet and designed by Margaret Mackenzie. The rug is called Cranberry Bog. The light was a little dim in the display room, so the colors are more vibrant than shown here in the photo. Although you can’t see it clearly in the picture, the background wool in this piece was very interesting; a pale yellow shot through with a reddish thread. The last rug that I wanted to comment on is “From the Porch” by Lanci Valentine. I like the plants shown in dark silhouette against the vibrant sky. There were many, many more rugs that were just fascinating to see. Well worth a visit! The show is located at Champlain Valley Exposition Center in Essex Junction, Vermont. The show continues through Saturday. This entry was posted in Uncategorized and tagged friend Kris McDermet, Gail Duclose Lapierre, Green Mountain Rug Hooking Guild, rugs by ccmangesdetobias. Bookmark the permalink. Thanks so much for your good report of the rug show. Kris’ labyrinth rug is fabulous! Prices in the Johnson Woolen Mill Store knock me over. Even the remnant wool seems just too pricey. Thanks for the reporting and lovely photos. Yes, Kris’ “Labyrinth” rug is amazing. Enjoyed the hooked rugs too. After seeing “Labyrinth” as a work in progress at Methuen, it was great to see it as a completed work of art. Truly incredible! Wish I had been able to attend the show … maybe next year. The rugs you highlighted were fantastic. I especially like the Kris McDermet one. it was fun to see it finished .